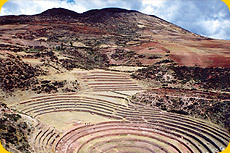 The Valle Sagrado or Sacred Valley of the Inkas is one of the most inspiringly beautiful places on Earth. The Urubamba River flows through this tranquil valley before continuing on its journey through a mountainous chasm to the magnificence of Machu Picchu. The valley is rich in history and culture, amazing Inkan ruins and natural beauty, peace and tranquility. 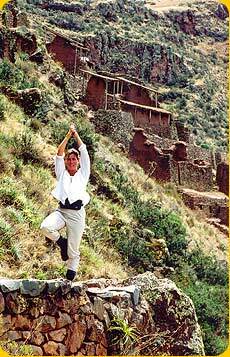 We invite you on a yoga journey to the ancient and mysterious land of Peru; we will explore the spiritual power of the Inkas and pre-Inkan people spanning back thousands of years. 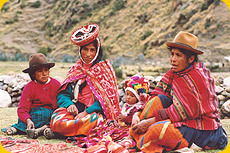 Now the vibrant and colorful Quechua people in their traditions of respect and appreciation for Earth and Nature are part of this enchanting Andean region. Our base will be the exquisite Willka T’ika Guest House, set in breathtaking gardens, situated between the quaint historic town of Cusco and Machu Picchu and surrounded by towering peaks. The peace and tranquility of Nature and the abundance of brilliant flowers and medicinal herbs are the perfect setting for yoga and meditation. The menus include organically grown vegetables, high protein Andean grains, delicious and nutritious cereals, fruit and legumes, all featured in gourmet vegetarian meals. Single and Double rooms are available. Seven sacred gardens for healing and meditation, indoor meditation rooms, solar-heated floral medicinal baths, healing massage rooms and a crystal bed healing room are all available to guests. Private massages or healing sessions can be arranged, as well as river rafting or horse riding. Or schedule a coca-leaf reading. Complementing our yoga and meditation practice this trip will also offer a spiritual and cultural adventure for mind, body and soul. We will visit ancient Inkan sites, contemplate at places of power, and explore temples, ruins, and visit local markets and artisan’s shops. At all times, we will travel with a guide to ensure our yoga adventure is organized to cater to our individual needs. We will be invited to participate in an authentic ritual led by a practicing healer – a seer in the Andean tradition and modern day representative of an age-old line of spiritual authority. The journey will culminate at Machu Picchu, the ancient capital of the Inka Empire, the City of Light with its mysterious ruins and natural wonders. The journey will culminate at Machu Picchu, the ancient capital of the Inka Empire, the City of Light with its mysterious ruins and natural wonders. 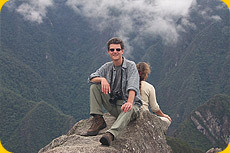 October 25 : Departure from USA for Cusco City via Lima. 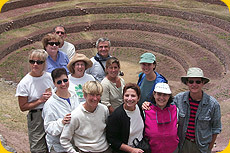 October 26: Arrival in Cusco, the ancient capital of the Incan Empire. Late afternoon walk through San Blas en route to the Korikancha Temple. October 27: Visit of Saksaywaman, overlooking Cusco and Tampumachay. We tap into the energies of Panchamama, Mother Earth. 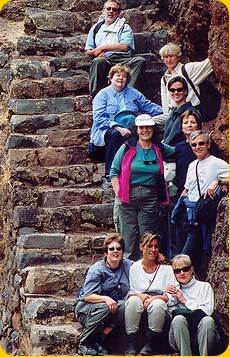 Drive to the Sacred Valley through spectacular Andean mountain scenery to our retreat center. October 28: Hike in the country side. An authentic Qero healer will lead a transformative fire ceremony. Preparing us for Machu Picchu. 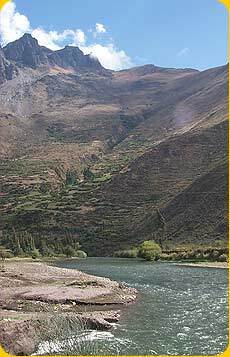 October 29: Drive to a Quechua mountain school, and continue with our guide to the spectacular ruins of P'isaq, and the temple of the Sun. October 30: Train to Aguas Calientes. 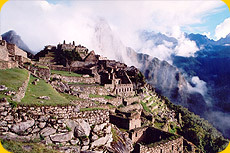 Bus to the terraces of Machu Picchu, the ancient "City of Light". Afternoon train back to Willka T'ika. October 31: Visit the quaint picturesque town of Ollantaytampu with its wonderful stonework and famous sun temple. November 1: Enjoy the pure energies of the Chakra Gardens and the 1000-year-old lucuma tree. Or visit a lively Peruvian market. November 2: Departure for Lima and flight home. 10:00am Check-Out-Time. 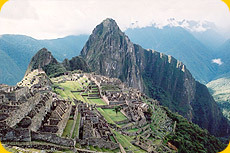 Ideal flights from Cusco leave between 2pm-6pm to Lima. Attention shoppers - Peru has markets filled with tempting goods. If you like to shop, when you see all the Andean offerings, you will want to buy a variety of beautiful hand-woven goods, ceramics, CDs, alpaca sweaters and jewelry. 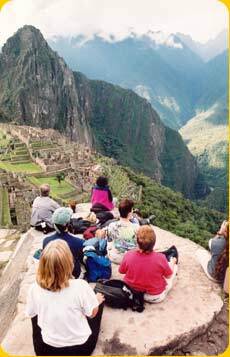 Enclose full amount, or a deposit of $800 per person, payable to the Chicago Yoga Center to reserve your space for Yoga in Peru. A deposit of $800 is due with your registration form by June 1, 2019 Balance of Payment in full is due by August 1, 2019. If you cancel your reservation in writing on or before June 1, 2019, we will refund all but $800. Cancellations made after June 1, 2019 cannot be refunded. Because our prepayments are not refundable, our cancellation policy must be firm. We strongly recommend that you buy travel insurance for the journey. All refunds will be remitted within 30 days. For sign up's after September 12, a late fee of $150 applies. The cost of this trip is $3,500. This includes your room (double occupancy, single supplement is subject to availability), six nights at Willka T'ika, and one night in fascinating Cusco City, transport, hotel accommodation, all time travel guide and yoga instruction. Organic vegetarian meals at Willka T'ika, and a delicious Peruvian welcome dinner in Cusco are included. We will travel as a group or help participants arrange their air transportation. Please schedule FLIGTHS to arrive in Cusco on OCTOBER 26th before 11 a. m.
Departure for Lima, November 2nd, ideal flights to Lima leave Cusco between 2pm-6pm. International roundtrip flights. Separate airport transfers and hotel bookings. Tips, sundries, alcoholic and bottled beverages, some meals, laundry and spa services. Due to the exclusive nature of this retreat, high season, flights and hotel selection depends on availability. Early booking is essential. Yoga classes will be taught by Suddha Weixler, including meditation, and talks on the history of yoga and its philosophy. Suddha began studying yoga in 1978 on his first visit to India. He spent eight years in a monastic environment learning the classical system. 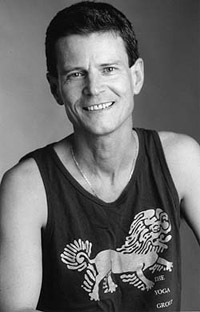 He was certified in 1984 and is the Director of the Chicago Yoga Center. Initiated into Raja Yoga and Meditation in 1982 by Swami Narayanananda, his training includes classical Hatha, the Iyengar method, Ashtanga Yoga with Sri K. Pattabhi Jois in South India and Vinyasa Krama of Sri T. Krishnamacharya as taught by Srivatsa Ramaswami. Suddha has been an Adjunct Associate Professor at the School of the Art Institute of Chicago since 1989, and enjoys the art of photography. On request, Yoga teachers receive 35 hours of Yoga Alliance CEUs.